CODAS was developed by two academics, Professor Richard De Mulder and Dr. Kees van Noortwijk. They were interested in increasing the efficiency of search engines when selecting documents relating to legal concepts. A breakthrough for CODAS came when they saw that the sophisticated search system they had created for finding relevant legal documents had another application too. As well as being researchers, working in the Law School of the Erasmus University, they were both lecturers. Increasing numbers of students demanded increasingly more time from teaching staff. Now hundreds of exams and assignments had to be marked and graded within a relatively short time. The students had the right to have the marking done with care and attention, but at the same time marking exams was a time consuming task. 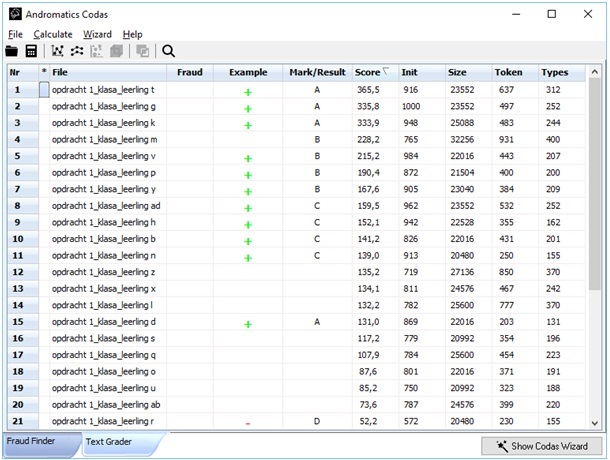 Could computer assisted marking not be the answer? The teacher would stay in control, but the program would considerably lighten the burden. Although already used by members of staff in various institutions in the 1990s, with respect to exam marking CODAS started small scale. This was because CODAS required that exams were done digitally. At the time, most universities simply did not have the facilities for digital exams. That is changing rapidly. Student assignments are all submitted digitally. Exams will be too. Educational institutions recognise that perhaps the only time young people write anything by hand it is in the exam hall! Writing by hand is simply not how students work anymore. And a hand written exam paper is a thing of horror for any teacher – poor, often difficult to decipher, hand writing and arrows pointing up and down in texts (a poor substitute for the cut and paste technique students are familiar with). Digital exams marked and graded by CODAS is the way forward. To further develop the CODAS software and prepare for its application in different educational environments, De Mulder and Van Noortwijk founded the company Andromatics in the year 2000. In the years that followed, CODAS was applied in various institutions, not only in The Netherlands, but also in other EU member states. As of 2015, Hans Gerritsen, René Schippers and James De Mulder provided support and contributed to Andromatics’ products and services. To provide educational institutions with user friendly software that will help teachers mark and grade exams. To enable teachers to focus on teaching and reduce work pressure through computer assisted marking and grading. Fraud checker: for assignments, essays and exams. Although there are many software systems that detect external plagiarism, this system checks for internal plagiarism. It checks whether students have in fact worked together when the assignment should have been done individually. For a detailed description of these modules, visit the CODAS page.